BDL170 will make your home improvements and interior designs jobs as easy as a pie. The tool is designed to project a horizontal or a vertical laser line that enables the user to sort out a number of projects like: wall to wall or floor to ceiling and the angle pro function gives an automatic reference for lines with angles. Black and Decker BDL170 has made alignment of pictures, shelves and more an easy task. When you use it you are guaranteed of doing the job right. Additional features of this tool are the capability to level automatically without the need of adjustments, it is also able to project horizontal and vertical laser line for a variety of applications, the angle pro offers an automatic reference for angled lines and this tool is salient for many home projects. It also has a rubber overmolds for additional protection and also comes with a black light for battery visibility of the angle reference points. It is also accompanied with accessories. The tool provides precise laser leveling for a variety of indoor household tasks as it comes with angle laser technology. is able to level automatically and it projects both horizontally and vertically as well It is able to level automatically for precise results and wall mount and attachments included for hands-free convenience. Uses Black and Decker BDL170 Bull’s-eye Auto-leveling Laser with Angle Pro It is used for indoor home tasks and interior design. It is also used for angled applications that include hanging items along the staircase. It is a superior product that will serve you right. Safety instructions and storage .The tool should be stored in a place out of reach for children and untrained individuals. Do not use optical tools like telescope or transit to view the laser beam. The laser should be placed so unintentional eye contact is avoided. Do not operate the laser around children or allow them to operate it. Do not disassemble as modifying the product in any way may be able to increase the risk of laser radiation. Do not operate in explosive surrounding. Use only with specifically designated batteries. When installing the batteries, ensure that the laser on/off actuator is in the full off position by sliding the actuator to the left off position, then open the battery compartment cover which located on the back side of the unit and insert the fresh 1.5 volt batteries and check again the positive and negative terminals are placed correctly. After confirm close the battery compartment cover and click into place. Black and Decker BDL170 Bull’s-eye Auto-leveling Laser with Angle Pro is sold at affordable and competitive price. When you purchase one from amazon you will get a high quality and reliable product that will exceed your expectations in terms of durability. When you choose to buy Black and Decker BDL170 Bull’s-eye Auto-leveling Laser with Angle Pro, Black and Decker company team of professionals will help you with answers for any question you may have concerning this product. They will show you how to make use of this tool so that you make the most out it when you purchase one. They will illustrate on how you can change the batteries and guide you through other important things you need to know before you start using the product. 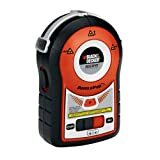 Users of the Black and Decker BDL170 Bull’s-eye Auto-leveling Laser with Angle Pro have awarded it 3.6 out of 5 stars at amazon laser level reviews. That is a good rating and it reflects the effectiveness of the laser level. Black and Decker BDL170 is considered as the best laser level in many rankings due to its high quality, durability, and warranty.